Recently a new residents group sprang into existence, its mission statement being to ‘give support to a community who have suffered ongoing abuse from the police, and to give a voice to local people.’ If it sounds like a throwback to the ‘bad old days’ that is solely by dint of manipulation of perceptions whereby nationalists have been cajoled and beguiled into accepting that the good new days are now upon them. *	Local people were provoked by police who addressed residents as “scum”. *	Two people tried to take photographs of police harassing residents but were stopped and forced to delete the pictures. *	Police prevented the mother of a young child from entering her home to get nappies for her child. *	Police continually drove past openly taking photographs of residents. *	The searches were initially carried out using only verbal warrants. *	They aggressively pushed mothers and children out of their way and shoved a pregnant woman against a fence as they passed. *	A 14 year old youth had just left a nearby house and was violently grabbed by the throat and dragged over a fence by police. 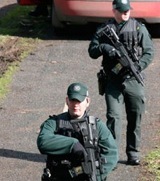 *	Police continued to taunt residents with sectarian abuse such as “fenian scum”. There was a high police presence ... and a general feeling of tension due to the police aggression during the raids. Around lunchtime, landrovers returned to the estate. Police jumped out of landrovers; approximately 30 officers charged through the estate and residents’ gardens adjacent to the Athletic Grounds. They aggressively pushed mothers and children out of their way and pushed a pregnant woman against a fence as they passed. A 14 year old youth had just left a nearby house and was aggressively grabbed by the throat and dragged over a fence by police. At this point a few of the residents intervened. Within the next few minutes another youth who had just walked out of his aunt’s house was charged at by a number of officers and trailed into the back of a landrover ... One policeman raised a baton and threatened a female. When this happened a large group of residents stood together and faced the police who then backed off slightly but continued to verbally abuse people. In spite of all this nothing was seized during the raids which would lend justification to their having been launched in the first place. No weapons or anything incriminating were discovered during the course of two days of police raiding in the area. Local residents placed the PSNI activity in the context of downright provocation, the backdrop to which was the orange triumphalism which runs rampant mid July every year. For the residents of Drumarg the good new days are a long time in coming. As for the bad old days ‘they haven’t gone away, you know.’ The resident cited above claimed that PSNI harassment of people living on the estate had been ongoing over a number of years. Many nationalists in Drumarg feel that they have been abandoned by political representatives eager to ingratiate themselves with the PSNI. Their decision to form an association committed to the protection of those whose rights are being trampled under foot by a rampant British police force is evidence that healthy political opposition exists in a political ensemble which institutionally frowns on the concept of opposition. The PSNI, confident that the peace process will impose a regime of silence on those critical of its abusive behaviour is finding that it is not all plain sailing. The residents of Drumarg with every right to expect more show no intention of settling for less.